An all new production of the Broadway and West End smash hit musical comedy Sister Act stars Alexandra Burke who recently wowed audiences with her role in The Bodyguard. Based on the smash hit movie starring Whoopie Goldberg and Maggie Smith, Sister Act tells the hilarious story of Deloris Van Cartier, a disco diva whose life takes a surprising turn when she witnesses a murder. Under protective custody Deloris is hidden in the one place she won’t be found – a convent. Disguised as a nun and under the suspicious watch of the Mother Superior, Deloris helps her fellow sisters to find their voices as she unexpectedly rediscovers her own. Featuring original music, dazzling dance routines and songs inspired by Motown, soul and disco, Sister Act is one of the funniest and funkiest musicals around this autumn. The show is directed and choreographed by Strictly Come Dancing judge Craig Revel Horwood, who has many theatre credits to his name as a director, choreographer and performer. 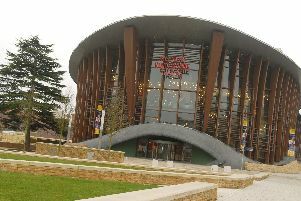 Sister Act will be at Milton Keynes Theatre at 7.30pm from Monday, September 26, through to Saturday, October 1, with additional 2.30pm matinees on the Wednesday and Saturday. Tickets cost from £15 and are available online at www.atgtickets.com/miltonkeynes or from the box office on 0844 871 7652.